Mumbai or Bombay is a very popular place in India's west Coast. It is also india's largest center as per Financial center. Mumbai is favorite for tourist due to place Gateway of india, Elephanta Caves , Sidhivinayak etc. Here we list out all the famous places in Mumbai in sequence. Marine Drive is a km long, arc shaped boulevard along the South Mumbai coast, starting from the southern end of Nariman Point and ending at the famous Chowpatty beach. The coast lines the Arabian sea and is the best place to watch the sunset in Mumbai, or even to just take a leisurely stroll by the sea any time of the day or night. The Marine Drive is also known as the Queen's necklace on account of its shape and yellow streetlights. It makes for a spectacular view at night - you can go to either end of Marine Drive after sunset and see the lights glowing in a perfect arc all along the coast. People come to walk here in the evening to experience the brilliant sunset. It is also one of the places people visit late at night, and you will find vendors selling chai and sutta at all hours. 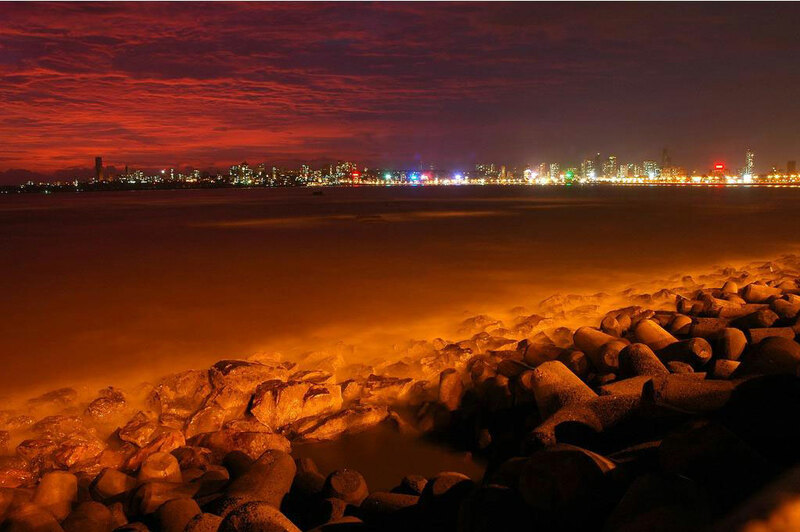 The sound of the waves, a view of the Mumbai skyline and the starry sky easily make Marine Drive one of the most romantic spots in the city. Why People Love Marine Drive? In the fast-paced life of Mumbai, Marine Drive instils a sense of calm and serenity. The Marine Drive makes the Mumbai monsoons a lot more special as the view from there is spectacular during rains. If you happen to visit during a high tide, you will get splashes of water from the strong waves crashing on the shores below! It is also the perfect place for morning or evening walks. For students from a lot of nearby colleges, this is a favourite hangout spot. It has long been an inspiration for the artists, writers, poets, musicians and photographers, and you would find a lot of movie scenes shot here. क्यों लोग मरीन ड्राइव se प्यार karte hai? Given the splendid view, Marine Drive is one of the most prestigious area for any kind of real-estate, either commercial or residential. The cost here is one of the highest in the world, not just India, with prices for a 3bedroom apartment starting from 30Cr INR and upwards! A lot of celebrities and industrialists have been living here for a long time. It is considered as the largest viewing gallery in the world and several events have been hosted along its walkway. On the 65th Republic Day of India, in 2014, there was a parade held along the entire stretch of Marine Drive. An IAF airshow was held in October 2004. Bombay Marathon is held every year in February since 2004. 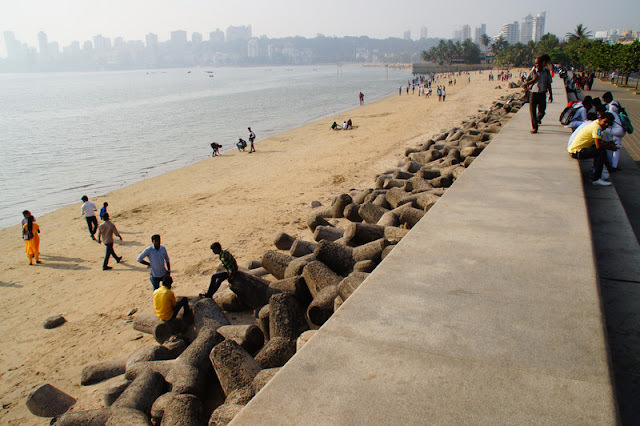 There are also various beautification projects related to the Marine drive. The Gateway of India is, without doubt, one of the most popular tourist hotspots of Mumbai. It is located at Apollo Bunder Waterfront and overlooks the Arabian Sea in the most beautiful way. 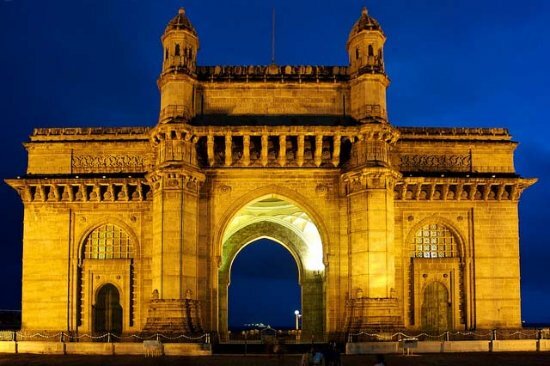 One of the most distinguished monuments in Mumbai, it was built in the year 1924 by famous architect George Wittet as a commemoration of the visit of King George V and Queen Mary to Mumbai. The imposing structure of the monument is a beautiful confluence of Indian, Arabic and Western architecture and has become a popular tourist hub in the city. Nicknamed 'Mumbai's Taj Mahal', the foundation of this landmark was laid in 1911 and was inaugurated 13 years later in 1924. The structure in itself is a made of yellow basalt and solid concrete and is embellished with numerous Muslim and Hindu motifs as well. The basalt arch of the Gateway served as the entry and exit access to India through waterways before independence and was the exit point from where the last British ship left India for England. There are statues of Swami Vivekananda and Chhatrapati Shivaji that have been installed near the Gateway as well. The view from the sea of the Gateway complex, especially at night, is as beautiful as that of the Queen's Necklace from the Marine Drive. An imposing edifice, the Gateway of India is a symbol of India's rich history and cultural heritage. 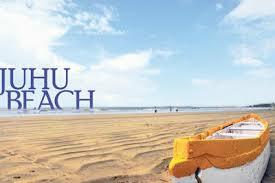 Juhu beach is the longest beach in Mumbai, and arguably the most popular among tourists as well. Juhu beach is renowned for its wide variety of street food with a very typical Mumbai flavour. The nearby area of Juhu is a posh locality in Mumbai, home to a lot of famous Bollywood and TV celebrities - the most famous being Amitabh Bachhan's bungalow - and it is not very rare to spot a celebrity jogging on the beach. This is also one of the best spots in Mumbai to watch a sunset, with a cool evening breeze, and one of the few places where you see the "relaxed" side of the Maximum City. Television shoots are often held and a number of toy-sellers, roasted corn vendors and acrobats attract the eye. Stretched from Vile Parle to Santa Cruz, children often have fun plane spotting with a departure runway near the edge of the sea. You may also visit the iconic Iskcon Temple which is meters away from the beach or indulge in a theatre experience at the famous Prithvi Cafe. Jalsa, Amitabh Bachchan's home is also in the vicinity and attracts an enormous crowd on weekends. There are also a number of famous cafes, restaurants, and pubs around this area which never sleeps, you'll find people taking a stroll as late as 3 am at night. Juhu beach was a big favorite with the Mumbai locals during the 90s, but it had become notorious for being very dirty because of a large number of tourists. However, in the last couple of year the BMC had made a lot of efforts to keep the beach clean. It is now cleaned almost daily, and lot of dustbins have been installed which help keep the area much cleaner than it used to be. For those looking to avoid the mad rush of tourists and experience the relaxed nature of the beach, early mornings are a great time to visit. The beach is surprisingly empty, with only the nearby residents coming here for a morning run, walk their dogs, or play frisbee. You would see a number of runners running along the 3km+ coast, quite a few of them barefoot. Almost all the food stalls are closed at this hour, and there are only a few vendors selling tea or coconut water. The beach is cleaned late night/early morning, so this is also when the beach is at its cleanest! Facing the west, Juhu beach naturally has a brilliant sunset, in all weathers. Granted, the beach is crowded at this time - specially if it's a weekend - but walk a few minutes away from where all the food stalls are, and you should be able to find an empty-ish spot for yourself. Grab a simple blanket (available on rent for rs. 50) and relax on the sand while enjoying the sunset. You can get a lot of snacks to eat while sitting - like chana jor garam, bhel, vada pao to name only a few. The variety of snacks that you can get on the beach is pretty incredible. 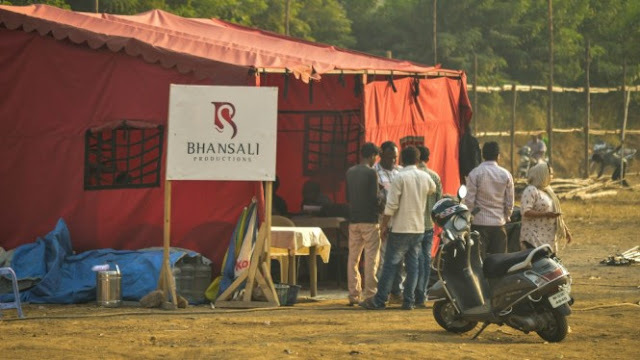 There are a lot of shops near the main parking area which sell a number of local food items - panipuri, bhelpuri, misal pao, pao bhaji, vada pao. You can also get great South Indian food : masala dosa, idli, vada being the most common. Chinese is pretty popular and common too. Although the street food here is not the tastiest - and many would argue healthiest - there is a lot to choose from, and street food lovers would definitely be excited. Although the police start driving people away from the beach around 1AM, it is not too uncommon (or difficult) to sneak in from one of the side openings to the beach. The beach is surprisingly quiet at this hour, with hardly a few other adventurous souls venturing out so late. As long as you are not a nuisance, you can take a quiet stroll along the beach or sit and talk on the sand. 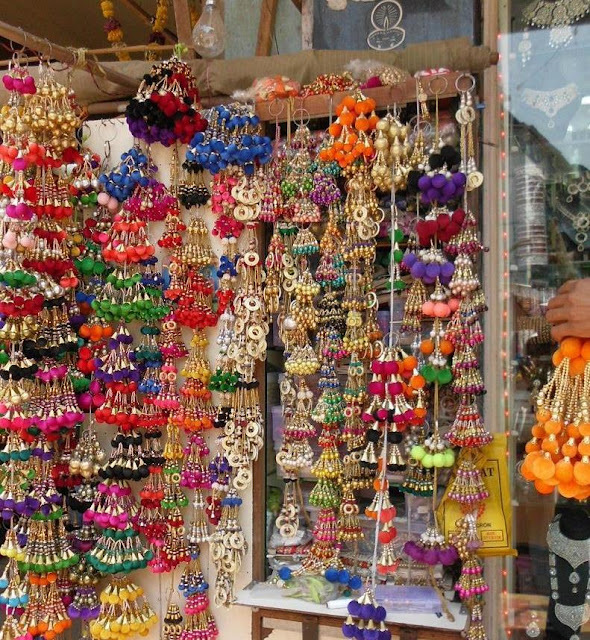 Shopping is the first and foremost reason to visit Colaba Causeway. The street greets you with stall-after-stalls of stockpiled things. While stuff like shawls, t-shirts with popular superheroes, slogans and logos, bags, bangles, earrings, hair accessories, sunglasses, amusing toys, useful domestic items and decorative pieces are found on the road at steal-worthy prices; there are exquisite galleries, boutiques and outlets also to lend you a taste of some fine and sophisticated shopping. There is Le Mill for posh designer wear, Good Earth for offbeat home décor and apparels with a rustic feel and for unique costume jewellery, there is Curio Cottage. There is also a lovely trinket shop Parvati Villa, beach fashion store Oak Tree and souvenir shop - The Bombay Store. If you are an impulsive shopper, you need someone to keep an eye on you. 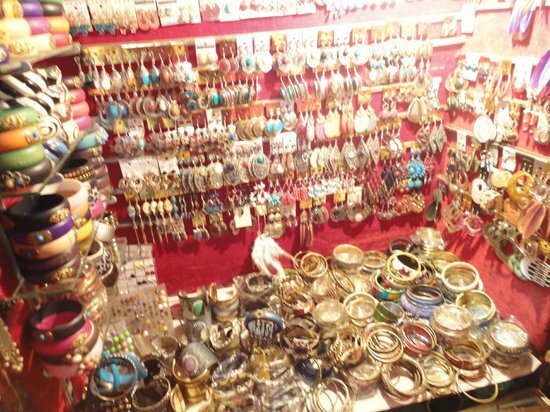 The very paradise of a shopaholic, Colaba Causeway literally sells everything you can think of buying. All this walking can easily call for delectable food craving and for that you have too many choices to pick from. There you can find the legendary Delhi Durbar, Café Mondegar or the Leopold Café and Bar, which is mass-favourite and frequented by most tourists. The famous Theobroma, adjacent to Oak Tree is for those who have a very distinct and posh sweet tooth. The shop is a stylised boutique of European pastries, tarts, croissants, shortcakes and a huge range of many such products. In 1796, the southern-most tip of Mumbai had been declared a cantonment area and as a result, the heart of the city - the Fort area and the surrounding parts were getting overcrowded. More and more people shifted there for better access and employment and soon it headed towards encroachment. Many accidents of boat-capsizing due to overloading led the Government to decide on the construction of the land-link. Added to the dire necessity was that the then Governor of Bombay, Lord Elphinstone built his residence on Malabar Hill and it became urgent to complete the construction of the Causeway. The Colaba Causeway was built by the British East India Company connecting the last two remaining islands of the seven which were yet to be connected with the mainland. The construction of the Colaba Causeway was completed in 1838 under the command of Sir Robert Grant, yet another governor of the city. It was later modified and widened in 1861 and then again in 1863. In 1873, Stearns and Kitteredge introduced horse-drawn tram-cars were introduced to ferry people across. Built of glass, the tomb is a beautiful illustration of the Indo-Islamic style of architecture. A marble courtyard contains the central shrine. The tomb within the mosque is roofed by a brocaded red and green cloth, supported by an exquisite silver frame and marble columns. The main hall has marble pillars engraved with creative mirror work: blue, green, yellow chips of glass arranged in varied designs and Arabic patterns which spell the ninety-nine names of Allah. As per Islamic customs, there are different praying rooms for ladies and gents. Many famous personalities visit the shrine to seek blessings. Haji Ali belonged to Bukhara, which lies in present-day Uzbekistan. This shrine has a mystical story attached to it. According to legends, Sayyed Peer Haji Ali Bukhari once came across a poor woman crying on the road and holding an empty vessel. Upon inquiring about the matter, she told him that she had spilled the oil she was supposed to be carrying home and was now afraid that her husband will punish her. He then accompanied her to the spot where she had spilled the oil and prodded the ground and oil came gushing out. The woman was delighted and went home happily. Later, recurrent dreams indicating that he had injured the Earth haunted him and his health began to deteriorate. He then decided to travel to India and decided to stay here so as to spread the word of Allah and Islam. From that point of time till the end of his life, Haji Ali dedicated his life spreading the wisdom of Allah and devotees would regularly visit him. Before he died, he instructed his followers that they shouldn't bury him immediately, rather they should drop his shroud in the ocean and bury him where it is found. In accordance with his wishes, the Haji Ali Dargah was built in the year 1431. According to another belief, Haji Ali donated all his wealth for a journey to Mecca and died in between. Miraculously, the casket carrying his body floated back to Arabian shores and got stuck in the twine of rocky islets just off the shores of Worli. The shrine of Haji Ali is built on a small island some 500 metres away from the main coast, with the beautiful Arabian Sea in the backdrop. This magnificent structure is spread over an area of 4,500 sq. meters and is 85 feet tall. Due to its location, the road to dargah gets submerged during high tide, making it entirely inaccessible. The architecture of the Dargah in itself is a magnificent example of the Indo-Islamic style of engineering. Made out of dazzling white marble, the shrine has a central dome which is flanked by four smaller spires in the four corners. The Dargah and the mosque underwent renovations in the year 1960 and 1964, and the new sanatorium was built in place of the old one. The present building lies has two floors which have the main cenotaph of saint Haji Ali, a Qawwal Khana, ladies' rest shade and toilets. The tomb of the saint is located in the central shrine and is covered with a red and green coloured cloak, also called the 'Chaddar'. Surrounding the mausoleum is a marvellous handiwork in a myriad coloured glass, spelling out ninety - nine names of Allah. A unique way of offering prayers to Allah is through the means of Qawallis, which are melodious invocations to the Almighty. 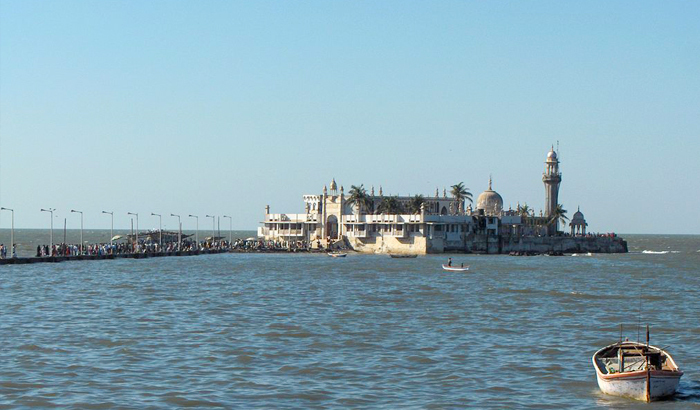 Haji Ali Dargah has a dedicated hall for this purpose and is extremely famous for the same throughout the country. Spirituality and tranquillity reverberate through the complex as the Qawalls sit down on the floor with their instruments and fellow singers and begin the prayer. Throngs of people sit surrounding them, mesmerised by the intonations and instruments. If you happen to visit this destination, make sure you attend the Qawalli session, for it is an experience of a lifetime. The Siddhivinayak Temple is a revered shrine dedicated to Lord Ganesha and is one of the most significant and frequented temples in Prabhadevi of Mumbai, Maharashtra. This temple was built in the year 1801 by Laxman Vithu and Deubai Patil. The couple did not have any children of their own and decided to build the Siddhivinayak temple so as to fulfil the wishes of other infertile women. It is one of the richest temples in Mumbai and devotees visit this temple in large numbers on a daily basis. The statue of Lord Ganesha here is believed to be self-manifested. The Siddhivinayak temple has a small sanctum housing the idol of Shri Ganesha, which is about two and a half feet wide and made out of a single piece of black stone. The trunk of the Lord tilts to the right, and a snake adorns the idol much like a thread would. The deity has four arms and is hence known as 'Chaturbhuj'. He carries a lotus in his upper right hand, a small axe in his upper left hand, a rosary in his lower left hand and a bowl full of his favourite snack 'modaks' as well. Flanked by Goddesses Riddhi and Siddhi who signify wealth and prosperity, the image of the Lord here is one that is of utmost importance to the people of faith. A temple of Lord Hanuman is also present in the premises. The story behind the construction of the Siddhivinayak temple is that of faith and belief in the Lord. The building was funded by rich Agri woman named Deubai Patil, who did not have any children of her own. She decided upon building a temple dedicated to Lord Ganesha so that he may fulfil the wishes of other childless couples and bless them with children. The construction of the Siddhivinayak temple was completed on 19 November 1801, with the original structure being a square edifice adorned with a dome - shaped spire. Ramakrishna Jambhekar Maharaj who a disciple of the Hindu saint Akkalkot Swami Samarth, buried two idols in front of the present idol upon the instructions of the Swami. As was prophesied by Swami Samarth, a Mandar tree sprouted from the buried idols with the image of Svayambhu Ganesha in its branches after a period of 21 years. The imposing structure of Shree Siddhivinayak temple comprises of a primary 'Kalash' which towers to a height of 12 feet, three reaching up to 5 feet and 33 others which stand at a height of 3.5 feet. Thus, 37 gilded domes embellish the main temple complex. The old part of the Siddhivinayak temple has a hall, the main sanctum, a verandah and a water tank as well. The new complex of the temple was built as a part of renovations so as to enhance the magnificence of this shrine. The architect Ar. Shri. Sharad Athale of SK Athale & Associates made a study of the temples in Rajasthan and Tamil Nadu before finalising the design of the temple. 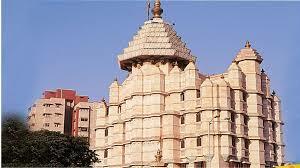 After making the necessary arrangements, the construction of the Siddhivinayak temple commenced in the year 1990. The old idol was kept intact whilst a multi angular six - storey structure was built over the gold plated domes. Three main entrances leading up to the interior were constructed and the crown of the temple was redesigned as well. After meticulous work that was spread over a timeframe of three years, the construction gave way to the Siddhivinayak temple as we know it today. Shree Darshan - 1:30 PM to 7:20 PM. Popularly known as Chowpatty, the beach is located in southern Mumbai along the western railway route. This small sandy beach is a superb place to chill, and a must visit for all tourists who are seeing Marine Drivefor the first time. The white sand glistens beautifully in the sunlight, as the adjoining waves dance to the movement of the pleasant breeze. This beach is a retreat from the mind-numbing and chaotic routine of the day-to-day life. Most people visit this place to unwind and relax after a long, strenuous day. At night, the beach appears to look like a colourful fair. Children from all age groups rush to ride the Ferris wheel and merry-go-rounds, while the adults indulge in the city's famous street snacks. Visitors also head to nearby attractions and local markets, to get the most out of their day out. Never is this beach empty or deserted. You will always find one or the other person here, lazing around on the beach; or children, lost in their world, blithely building sand castles along the shore. All in all, the Girgaum Chowpatty offers fun, frenzy and delights all rolled into one, and it is worth spending a few hours here to break free from the usually claustrophobic city. There are tons of activities that you can indulge in, to relax and enjoy yourself at the Chowpatty. These include horse and cable rides, long walks down the beach and fun and exciting games. The most obvious thing to do here is to take a long walk along the sea shore and enjoy the picturesque views, with the cool breeze gently playing with your hair. However, avoid swimming here as the water is heavily polluted. People often amuse themselves with snake charmers and dancing monkeys who entertain the crowds. Fortune-tellers also grab the attention of many visitors. Camel and horse rides are also available here. Visits to the Chowpatty are a pure delight for the children, who enjoy themselves at this beach. Merry-go-rounds, Ferris wheels, and bee-bee gun shooting galleries are some fun options for them. Local vendors also give 'chatais' on rent, which is chargeable per hour. You can perform yoga asanas here or simply lie down and relax on these chatais. Open air beach massages are another attraction of the Girgaum Chowpatty. Simply lie down on the sheets and enjoy the massage. If you are looking for opportunities to simply sit down and introspect, just grab a quiet corner and enjoy the view. A UNESCO World Heritage Site, Elephanta Caves is a specimen of rock-cut art and architecture from the times of medieval India. 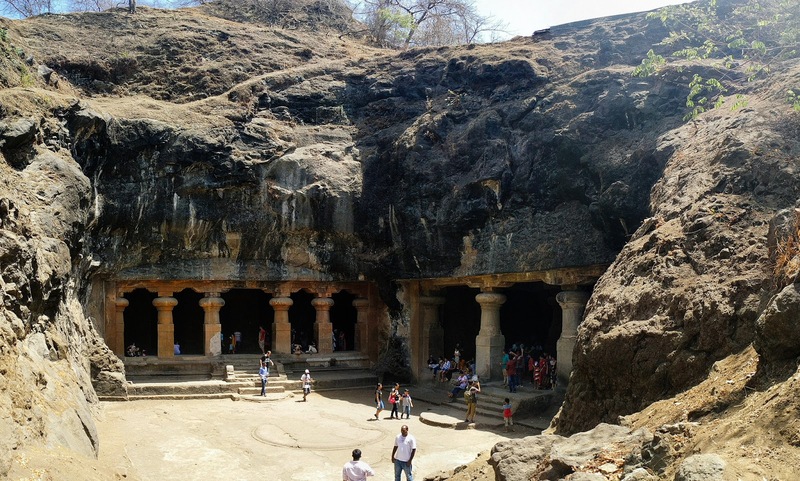 The caves are located on the Elephanta island which is situated at a distance of 11 km from the city of Mumbai. Natively known as Gharapurichi Leni, the Elephanta Caves that exist today are ruins of what were once elaborately painted artworks. It also provides an amazing view of the Mumbai skyline. There are two groups of alcoves in the site of the Elephanta Caves, the first is a large group of five Hindu caves and the second one is a smaller group of two Buddhist caves. The Hindu caves contain the stone sculptures representing the Shaiva Hindu sect. The architecture of the caves dates back to the 5th and 8th centuries, but the story of their origin is still a mystery. The caves are an expression of art and a number of important imageries are sculpted here, which include 'Trimurti' or three headed Shiva, 'Gangadhar' which is a manifestation of the river Ganga as she descends to the earth and 'Ardhnareshwar', which is a representation of Shiva and Parvati in the same body. In addition to being an important heritage site, the Elephanta Caves are also an unlikely trekking destination. The history of the Elephanta Caves has no solid proofs and is based on a number of inferences drawn from speculations and postulations. It is believed that the Elephanta Caves were built by Pandavas, however, some also credit the same to Banasura, the demon devotee of Shiva. Local tradition dictates that the caves were not built by the hands of men at all. Historians date the Elephanta Caves back to late 5th - 8th century AD but excavations of Kshatrapa coins dated to 4th century AD have also been unearthed here. Records are available from the defeat of the Mauryan rulers of Konkan by the Badami Chalukyas emperor Pulakesi II. At that time, Elephanta was known as Puri or Purika and was the capital of the Konkan Mauryas. As a result of this, some historians believe that the caves were built by them during their reign. Other historians have attributed the caves to the Kalachuris who are believed to have some relationship with the Konkan Mauryas. These assumptions are based on the fact that the Elephanta caves are dedicated to Pashupata Shaivismsect, a sect to which Kalachuris as well as Konkan Mauryas belonged. Other than these, the Chalukyas and Rashtrakutas are also believed to have been behind the creation of these magnificent caves. Following the rule of the Chalukyas, Elephanta Caves fell into the hands of the Gujarat Sultanate, who surrendered it to the Portuguese in 1534. The Portuguese renamed the island as "Elephanta Island" due to the huge stone statue of an elephant that was situated near the island. Elephanta Caves saw major deterioration under the Portuguese until 1661, when the caves came under the territory of the British. The main cave was restored in the 1970s but the other caves are still in a very deplorable condition. The Elephanta Caves got featured in UNESCO's list of World Heritage Site in 1987 and became an even more popular tourist destination after that. The whole complex of the Elephanta Caves is built on an area of 60,000 square feet and it has seven caves. The main cave was the Hindu place of worship under the Portuguese rule. It has a pillared mandapa, open porticoes and an aisle. The walls are carved out of stone and a number of deities make an appearance here. The main cave has a statue of Ravana lifting Kailash mountain, Shiva-Parvati on Kailash, Ardhanarishvara which is a manifestation of Shiva and Parvati in the same body, Trimurti which is the three forms of Lord Shiva, Gangadhara which is a cascade of the Ganges from the heavens to the earth, a depiction of Shiva's wedding, Shiva slaying Andhaka, Nataraja or a depiction of Shiva performing the Taandav, Yogishvara and the Shiva Linga. The east wing shrine of the Elephanta Caves has carvings on Kartikeya, Matrikas, Ganesha and Dvarapala upon its surface, while the west wing has Yogishvara and Nataraja adorning the caves. Since the Elephanta Caves are located on an island, one has to take a ferry to the islands which make up for a joy ride in its own right. The first boat leaves from the Gateway of India ferry point at 9:00 AM while the last one leaves at 2:00 PM sharp. The ferry can cost anywhere between INR 130 to 150 according to the type of ride you choose. The ferry skimming through the waters of the Arabian Sea is especially enjoyable for children, and you can also grab some snacks on the go. Victoria Terminus, a former name for the Chhatrapati Shivaji Terminus, is a modern railway station in the bustling capital city of the western state of India, Maharashtra. The marvellous structure is an awesome illustration of the Victorian-Gothic style of architecture in India. In fact, the railway station, which still functions as usual, is declared as a World Heritage Site under UNESCO. The station is always bustling with the sounds of the metro city and the locals. It could be noise and crowd for many, but some still manage to find lively colours and music in the ever so busy Victoria Terminus. It is one of the most famous historical landmarks in the country that symbolises the pre-independence India. Victoria Terminus was constructed in 1887. It is the Central Railway Headquarter and is well-connected to all the parts of the country. It serves long-distance trains and short-distance or commuter trains which are often called local trains. The terminus indicates British Commonwealth and represents the commercial aspect of Mumbai. The railhead stands witness to the city's progress over the period and the growth of the Bollywood film industry in India. It was here that the famous song 'Jai Ho' was shot for Slumdog Millionaire and some marvellous scenes for the Bollywood Movie Ra One. The view of the station and the population that gathers to commute on a regular basis could be overwhelming for many. Visitors can click pictures of the magnificent structure from a little distance away from the terminus. Visitors should see the building after sundown. The night lights brighten up the grand building and the view, so magnificent, will take your breath away. 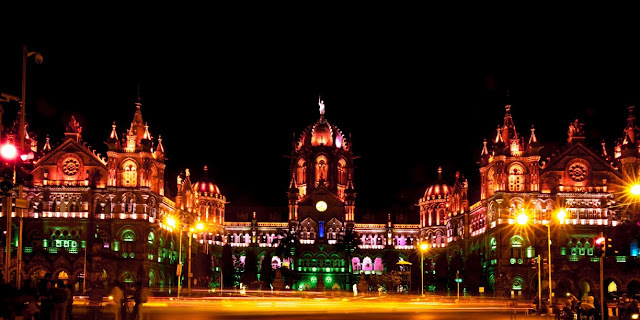 The Victoria Terminus, now known as the Chhatrapati Shivaji Maharaj Terminus (SCT) is built on a piece of land which, at that time, served as a warehouse to store goods that were either exported from or imported to Mumbai. It was only in 1853 that a railway station was built and was referred to as the Bori Bandar Railway Station. The first ever passenger train that operated in India was from Bori Bandar to Thane in 1853. In 1878, it was decided that the railway station will be rebuilt as Victoria Terminus to commemorate the Queen's Golden Jubilee and the Bori Bandar Railway station was officially known as Victoria Terminus in 1887. The terminus was designed by a British architect with the name F.W. Stevens who created an eclectic melange of Indian and British Architecture in his designs. The terminus was a major hub of mercantile activities and was named after Queen Victoria who ruled India during that period. It took ten years to complete the construction of the structure and cost over 260,000 Sterling Pounds. With this expenditure, it was known as the most expensive structure in the city of Mumbai. In 1996, the Minister of Railways renamed it as Chhatrapati Shivaji Maharaj Terminus and is coded as CSMT or CST (Chhatrapati Shivaji Terminus). Mumbai also witnessed a terrorist attack in 2008 and CST was on the hit list. As time passed by, the Chhatrapati Shivaji Terminus stood the tests of time for over 130 years and continues to be the lifeline of Mumbai. The core of the architecture of Victoria Terminus is Victorian Gothic Style of Architecture. It is a perfect illustration of the beautiful amalgamation of Indian Architecture and the Victorian Italianate Gothic Architecture. One can notice the influence of Indian Architecture in the skyline, the intricately carved arches the ground plan and the turrets. Some of the work on the structure was done by the Students of Jamsetji Jeejebhoy School of Art. They mainly worked their magic on the tiles, the ornamental metal railings, wood carvings and grills. The central dome adorns dovetail ribs and has a platform that is 330 feet long that is connected to rain shed that about 1200 feet long. The interior consists of numerous spacious rooms that have high ceilings. The focal point of the entire structure is the high central dome. It is octagonal and has a ribbed structure with a figure of a female holding a torch in her right hand and a wheel with spokes in her left. The courtyard is enclosed by side wings which are anchored by turrets on each corner. This also balances and frames the central dome. The exterior consists of numerous windows and arches. The entrance has figures of a lion, and a tiger that represents Britain and India respectively and the entire structure is made of Sandstone, Limestone and Italian Marble. The structure houses about 18 platforms, out of which, 11 are for intercity trains, and 8 are for suburban trains. There are air-conditioned dormitories also available at the terminus that has about 20 beds for women and 58 beds for men. Officially known as Rajiv Gandhi Sea Link, this eight-lane cable-stayed bridge in Mumbai is the first project initiated by Maharashtra Government that commences West Island Freeway System. Bandra Worli Sea Link is one of the few bridges that is a cable-stayed with pre-stressed concrete-steel viaducts to hold it in place. Spanning across the arc of Mumbai's coastline, this sea link is a civil engineering wonder that reflects the modern infrastructure of the city of Mumbai. The bridge is designed to cater around 37,500 vehicles per day while reducing the time travel between Bandra and Worli by a big margin. The beauty of the Bandra Worli Sea Link is in its engineering genius which gently compliments the crystal waters it is built over. Overlooking the magnificent blue waters of Mahim Bay, this splendid architecture is a mighty sight to behold. Undeniably, the Bandra Worli Sea Link is an amalgam of natural beauty and man-made marvel. Roll your windows down as you whizz past the bridge and let the salty sea breeze run through your hair. The spectacle of Mumbai is especially appealing from the elevation of the bridge and makes it the perfect destination to capture a few candid shots of the city in all its glory. Bandra Worli Sea Link also overlooks the Worli Bridge and has a small park located nearby. The beauty of this attraction is enhanced during the night when twinkling lights adorn the bridge. Before the Bandra Worli Sea Link was built, Mahim Causeway was the only road connecting the western suburbs to Mumbai's central business district. This led to the north-southwestern corridor becoming highly congested during peak hours. To solve this problem, the Western Freeway project was conceptualized and the Bandra Worli Sea Link was the first phase of the project aimed at providing an alternative route to the Mahim Causeway. The foundation stone of the bridge was laid down in the year 1999 by Bal Thackrey. The estimated cost of the project was INR 6.6 billion and was supposed to be completed in a time period of five years. However, the project lost its momentum when it was subjected to numerous public interest litigations. A five-year delay ensued which increased the cost of the bridge to INR 16 billion. The Bandra Worli Sea Link saw completion in the year 2009 - 2010. 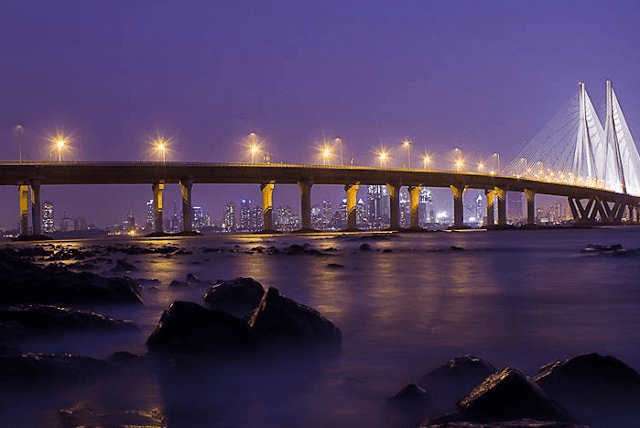 Bandra Worli Sea Link is one of the modern architectural spectacles of India which was built by Hindustan Construction Company, a project initiated by Maharashtra State Road Development Corporation (MSRDC). This architectural marvel was built by a joint effort of engineers from India, Egypt, China, Canada, Switzerland, Britain, Hong Kong, Thailand, Singapore, Philippines, Indonesia and Serbia. Interestingly, Bandra Worli Sea Link was the first cable-stayed bridge to have been constructed over the open Indian seas. Opened for the public in June 2009, this link comprises of pre-stressed concrete-steel viaducts on either side, which are heaviest precast segments to be built in India. Due to the geology of the seabed, the pylon towers used in the bridge have a unique and complex geometry while the main span of the structure is the longest concrete deck to have been attempted successfully. The largest pylon to have been used here measures at 128 metres with gradually decreasing heights as we move away. The Bandra Worli Sea Link is the first project in Mumbai which has been constructed using seismic arresters, making it resistant to earthquakes measuring up to 7.0 on the Richter scale. The construction of the bridge reduced the travel time to 7-10 minutes which used to take 45-60 minutes earlier. Inaugurated by UPA chairperson, Smt. Sonia Gandhi, this Sea Link plays a big role in the progress of making Mumbai a world-class city. Apart from reducing the travel time between Bandra and Worli tremendously, it was also proposed to link the western suburbs of Mumbai with Nariman Point, the main business centre. Visit this wonder to admire its might. The Prince of Wales Museum is a splendid structure situated in Mumbai and is regarded as one of the heritage buildings of the city. The foundation stone of this edifice was laid down by the Prince of Wales on the 11 November 1905, and it was established as a museum on 10 January 1922. The facade of the museum is a sight to behold in itself and sits in the midst of an expansive green garden. Adorned with stone and lattice work, the architecture of the Prince of Wales Museum is a blend of Indian, Mughal and British engineering styles. Inside, the museum holds some of the most exquisite artefacts relating to the rich and diverse history of India. Now known as 'Chhatrapati Shivaji Maharaj Vastu Sangrahalay', The Prince of Wales Museum is a Grade I Heritage Building of the city and is counted amongst one of the most prominent museums of India. The complex exhibits a myriad collection of ancient artefacts, artwork and sculptors of the country which give a unique insight into our past. The building also underwent a major renovation after which several new galleries adorning the artworks of Hindu God Krishna, textiles and Indian traditional costumes were opened. Preserved in its best form, the Prince of Wales Museum is a wonderful manifestation of India's glory and rich past. The idea of the Prince of Wales Museum was initiated in 1904 to honour and commemorate the visit of King George V to India and its foundation brick was laid down in the year 1905 by the Prince himself. A strip of land was later granted by the government of Mumbai, then known as Bombay Presidency called 'Crescent Site' on March 1, 1907. The credit for the admirable architecture of this building goes to a prominent architect, George Wittet, who erected the building in 1915. However, the museum complex was used as a military hospital and a 'Children's Welfare Center' during the First World War. The Prince of Wales Museum was finally inaugurated on January 10, 1922, by Lady Lloyd, the wife of George Lloyd, Governor of Bombay. Owing to its illustrious past, the building was granted the status of a Grade I Heritage Building of the city and was also awarded the first prize (Urban Heritage Award) by the Bombay Chapter of the Indian Heritage Society for heritage building maintenance in 1990. The museum was renamed ' Chhatrapati Shivaji Maharaj Vastu Sangrahalaya' in order to commemorate the memory of the founder of the Maratha kingdom. Showcasing the brilliant craftsmanship of the British era, the structure of Prince of Wales museum is considered as one of Mumbai's prized possessions. The museum complex covers an area of 12,000 square metres, while the built - up area of the museum is sprawled over 12,142.23 square metres. Constructed in the Indi-Saracenic style of architecture, the design of the museum building is a fusion of Gujarati and Islamic design of 15 to 16th century apart from the English brickwork. Sitting like a crown of the building is a remarkable white Mughal dome adding charm to its outlook. While the lush green gardens bound the museum, internally it is divided into three different sections: Natural history section, Archaeology section and Art section. The main building of the museum is built from Kurla Basalt which was sourced locally and buff trachyte Malad stone. Spread over three floors, the building has an entrance boulevard that is crowned by the central dome. Smaller domes surround the main one while the interior is adorned with 18th - century style columns, railings and balconies. The mordernization of the building in 2008 included new spaces for the installation of five new galleries, a conservation studio, a visiting exhibition gallery and a seminar room, in the Museum. The museum also houses a library. Needless to say, the Prince of Wales museum houses a wide variety exhibits of natural importance. The museum preserves several artefacts hailing from various countries like India, Tibet, Nepal and other far eastern nations. A collection of 2000 rare miniature painting from various notable art schools in India is also showcased here. You will find ancient Indian art and sculpture on display in the sculpture gallery of the museum. Decorative artworks made from wood, metal, jade and ivory also adorns the museum collection. Rare archaeological artefacts dating back to the 'Indus Valley' civilisation in the 2000 B.C. and Remnants from the 'Maurya' as well as 'Gupta' periods are also exhibited at the centre. The 'Natural History' section of the museum houses several reptiles, mammals, amphibians, birds and fishes. The museum also includes a section that houses Indian arms and armour that displays an array of weapons, swords, shields in addition to other projectiles. Several European oil paintings also adorn the walls of the museum. Exhibitions and lectures on various topics are held inside the museum on regular basis as well. Latest trends, a variety of clothes and the delicious aroma of street food is what Fashion Street in Mumbai is all about. One of the favourite shopping hubs for the people of Mumbai, especially the students, the place offers some of the trendiest and latest fashion clothes. An array of about 150 shops which sell an inconceivable assortment of accessories and clothing makes Fashion Street a paradise for a shopaholic. With a myriad variety of clothes, junk and bric-a-brac than any other corresponding shopping place, Fashion Street is a mind-boggling experience. You can even find the designer brands available here at a slashed price. Export quality garments are the highlight of the place attracting tourists as well, being sold at throw away price. Apart from clothes, this place located opposite the VSNL office building on M.G. Road sells a variety of accessories, hats and footwear. If you know how to bargain, this vibrant flea market is just the right kind of a place for you to shop. Although there is no dearth of items you can buy from Fashion Street, you should definitely check out a few of the essentials. Clothing, readymade garments, Accessories such as jewellery, hats, sunglasses, watches, bangles, earrings, and bracelets, gadgets and electronics, ethnic wear, sportswear and footwear sell like hotcakes here. Jeans, track pants, capris, shirts, skirts, tops, nightwear and toddler's clothes are available here as well. Sizes varying from XS to XXL are quite easily available which makes your shopping experience a lot easier. What's more, you can also placate the foodie in you with delicious food and snacks that are readily available here. Most of the shops are dilapidated buildings with a slight hint of Gothic architecture. One of the oldest markets in Mumbai, the place is a cluster of about 100 - 150 shops set in two rows with the feel of a flea market. However, keeping this market's popuarity in mind, a revamp is on the government's charts as well. 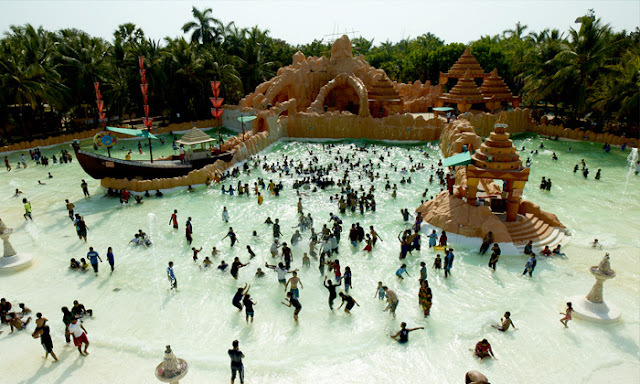 The Water Kingdom is Asia's largest theme water park that comes as a relief for Mumbai's summer holidays for families as being one the best experience The water park is one of the oldest in Mumbai, situated 47 km away from the city centre, with many exciting attractions and rides. The Water Kingdom is a part of the Essel group and is located at Borivali West next to Essel world. The water park is family and kids friendly featuring a variety of rides for all to enjoy. Some of the popular rides are 'What-a-coaster' that offers the tallest vertical drop in the country, Elephant Safari and Serpent Safari, which are different adventure slides and rides. • Road: The Water Kingdom can be reached via the Western Express Highway. turn left to Kashmira and drive down to Mira-Bhayander Road. It is also accessible by MBBT bus no. 4 from Bhayander bus depot. A paradise for art lovers, National Gallery of Modern Art (NGMA), Mumbai is a famous art museum possessing a magnificent collection of paintings, sculptures and artefacts since 1996.The multitude of artwork present in this charismatic gallery has drawn millions of visitors and left them awestruck for the rest of their lives. It is governed by the Department of Culture, Government of India and has over the period become a popular tourist attraction as it very convincingly depicts the modification of artwork in the field of visual and plastic arts. A blend of art and culture, this gallery houses the artworks of phenomenal sculptors, artists and painters including the legendary Pablo Picasso who is considered as the epitome of art and painting. The oldest artwork is known to be around 160 years old. The ancient artefacts such as statues and mummies from Egypt have also a played a crucial role in rousing the curiosity of the visitors. Moreover, the art museum also organises various art exhibitions which provide an intriguing platform to both the artists and the art lovers as the artists get a remarkable opportunity to showcase their talent while the art lovers can explore and quench their thirst for art. The first National gallery of modern art was inaugurated in the year 1954 in New Delhi by then Vice president of India, S. Radhakrishnan. Its subsequent branches later opened in Mumbai and Bangalore. The Mumbai branch is located near Regal Cinemas in Colaba, South Mumbai. 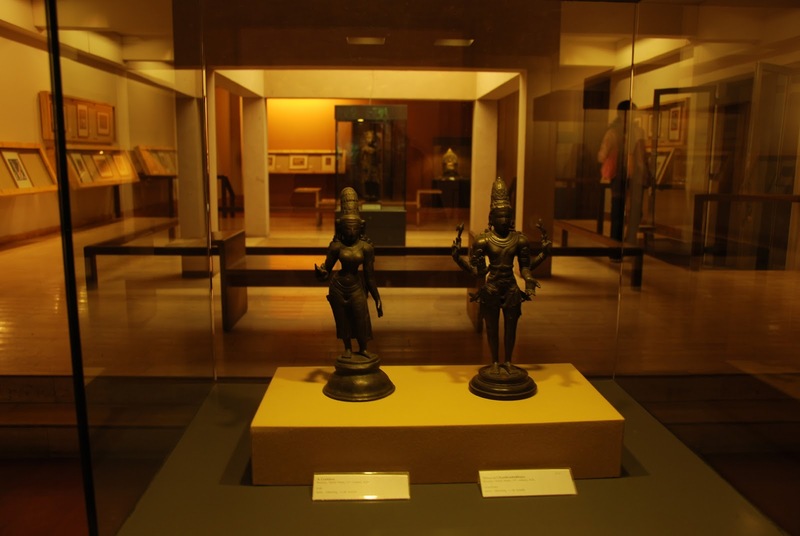 The gallery showcases some of the oldest artworks, dating back to 1857 and is considered one of the best in India. The idea behind the establishment of National Gallery of Modern Art in different parts of the country was the preservation and encouragement of higher studies and research in the field of modern art. It also aimed at capturing the changing trends in the art worldwide, from ancient art to the contemporary art. This intriguing initiative was fostered in 1941 by then Prime Minister Jawaharlal Nehru, Maulana Azad, Humayun Kabir along with the Indian art community. The inauguration of the first NGMA Gallery took place in New Delhi on 29th March 1954 by then Vice President, S.Radhakrishnan in the presence of eminent sculptors such as Sankho Chaudhuri, Sarbari Roy Chowdhury and Debi Prasad. It was designed by Sir Arthur Blomfield and was inspired by the concept of the Central Hexagon. Later, NGMA expanded its reach by inaugurating its subsequent branches in Mumbai and Bangalore. The location of each of these was meticulously chosen to lure maximum people. The National Gallery of Modern Art was initially known as the Sir C. J Hall, where in the early sixties it used to be a concert venue and later a place for trade unions, boxing matches, and wedding receptions. The hall was inaugurated with grand celebrations and an exhibition of masterpieces from Progressive Artists' Group. Protests by eminent artists such as Piloo Pochkhanawala and Kekoo Gandhy led to the successful introduction of floor space similar to London's Royal Albert Hall. The gallery could boast of its newly acquired exhibition space, only after 12 years of renovation. The very moment it was opened for public gaze in 1996, it gained loads of affection from different artist communities. The structure has a total of five exhibition galleries, library, cafeteria, lecture auditorium and storage and office space for permanent collection and travelling shows. The Gallery showcases amazing works of art dating back to hundred years. These are present in the form of both Visual and Plastic Arts. The Gallery of Modern Art has a phenomenal collection of modern and contemporary art. Below are the names of some famous artists whose work has been displayed at the gallery. The Mumbai branch of NGMA exhibits around 14000 artworks of eminent national and international personalities such as Pablo Picasso, Thomas Daniel, F.N Souza, M.F Hussain, Rabindranath Tagore, Raja Ravi Verma, Nandalal Bose, Amrita Shergill, Jamani Roy and many more. Some of the famous artworks present here are, Paintings by 'Calcutta Group' reflecting the terrible famine of 1943, Extraordinary European style works by Amrita Sher-Gil, 'Blue Lake' by Prabhakar Barwe, Artworks by 'Young Turks Group', Collection of abstract art by Krishen Khanna, Jehangir Sabavala, Eric Bowen and others showing the diverse use of colors, forms and textures. The Sculpture collection by famous sculptors such as Ramkinkar Baij,Dhanraj Bhagat, Meera Mukherjee, Pradosh Dasgupta and many more is equally intriguing. With the impressive cultural exchange programs and art exhibitions that NGMA Mumbai has hosted, it has indeed proved that talent has no boundaries. Over the years, it has provided an impressive platform for both the artists as well as the art lovers. 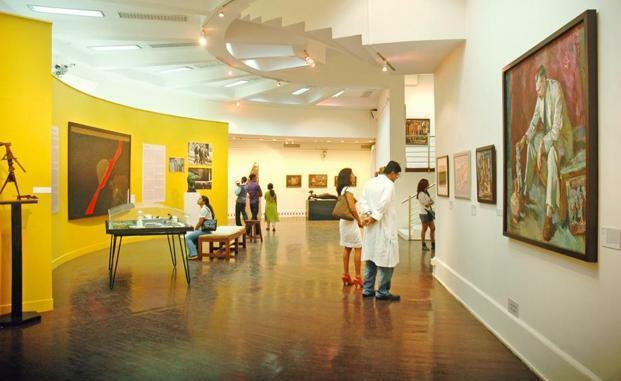 Some of the significantly successful exhibitions that NGMA has hosted in the past are, Ideas and images VI- The art in Mumbai, Video sculpture in Germany, The photograph: Painted, posed and of the moment etc. Located in a secluded area in the vicinity of Aarey Colony, Mumbai, Film City is often regarded as a home to the Bollywood. The place is so vast that about 1000 sets can be erected here simultaneously. Over the years, it has become one of the major shooting locations for Hindi film industry. Almost over 900 films other than television shows have been shot here as in the earlier days. Today, the Film City has grown to be one of the best film studios, well equipped with all the essential amenities and world-class facilities required in film production with incredible support from film personalities and government. It offers one a clear idea of know-how about shooting films in India. There is no denying the enigma that filmmaking holds on each and every one of us, and Film City gives a chance to live out our dream with its varied tours. A number of excursions are organised in the premises of the Film City which are aimed at the different aspects of movie - making, which are open to all who wish to experience it. You can visit sets that depict foreign locations right here in Mumbai, or learn the nuances of acting at the live movie shoot tours. A land where it is difficult to differentiate between reality and dreams, Film City is a must visit for all movie buffs. The Film City was built in the year 1911 under the precise guidance of the renowned veteran actor, director and film producer V. Shantaram. It was a dream project of one of the prominent film personalities, Dada Sahib Phalke under whose initiative the city was constructed and named after. As many as 900 films and television shows have been shot here, which only highlights the importance of this destination. Spread across a vast area of 520 acres, the Film City is comprised of about twenty indoor studios. Built on the lines of the Film City of California, today it is considered as synonymous to Bollywood. The place includes real-life sets such as villages, cities, mountains, lakes, fountains, gardens and picnic spots significant for the shooting. These facilities are accompanied with the most sophisticated technical instruments which impart an excellent quality to the movies and shows shot here. 1. MUMBAI FILMCITY TOURS: This is a two-hour guided tour which includes a visit to the famous locations in Film City, namely Helipad, Lake, Court, Church, Temple, Reserve Garden, and Khandala Bridge. You can also catch a glimpse of live shooting from the bus and take a look at the outdoor studio locations. This tour mainly covers the history and interesting facts about Bollywood. Light snacks and water are also provided to the visitors free of cost. Tickets for the same start at INR 599 per head. 2. BOLLYWOOD DREAM TOURS: The Bollywood Dream Tour is a two-hour excursion of the Film City studio which mainly covers the history of Bollywood and post-production activities, giving an interesting insight into what goes into making a movie. Ticket prices for the same start at INR 599 per head. 3. MUMBAI FILMCITY TOURS: This is a tour that takes you to visit Film Set where you can witness live shoots in Film City. It spans over a period of five hours and is an interesting way to explore the finer points of film shootings. Tickets are priced at INR 1699 per head. 4. COMBINATION TOURS: This package is a combination of the Mumbai Film City Tour and Dream Tour. Inclusions in this excursion include a tour to certain locations and sets, guide to discuss the history of Bollywood, tour to post-production activities, guide to discuss the history of post-production and experience post-production activities. Tickets are priced at INR 1099. 5. HALF DAY BOLLYWOOD TOUR: This package includes viewing a live shooting studio, experiencing post-production activities, visiting a dance hall and a live Bollywood dance show. Other inclusions are a look into post-production activities, a visit the to the dance hall, a live Bollywood dance show and lunch. Tickets are priced at INR 6000 per head. Global Pagoda, a monument of peace and harmony, is located near Gorai, North-West of Mumbai, in the western state of India. If one seeks to learn and experience mind control to relieve them from the continuous cycle of birth, death or constant pain and sorrow, this is the place to be. Along with admiring the serenely mesmerizing Pagoda, visitors can take a short 10-minute Aanapana Meditation session to experience how invaluable the technique of meditation is and then decide if they want to enrol for a longer term course. No matter what the verdict is, a trip to the Global Pagoda will be worthwhile. 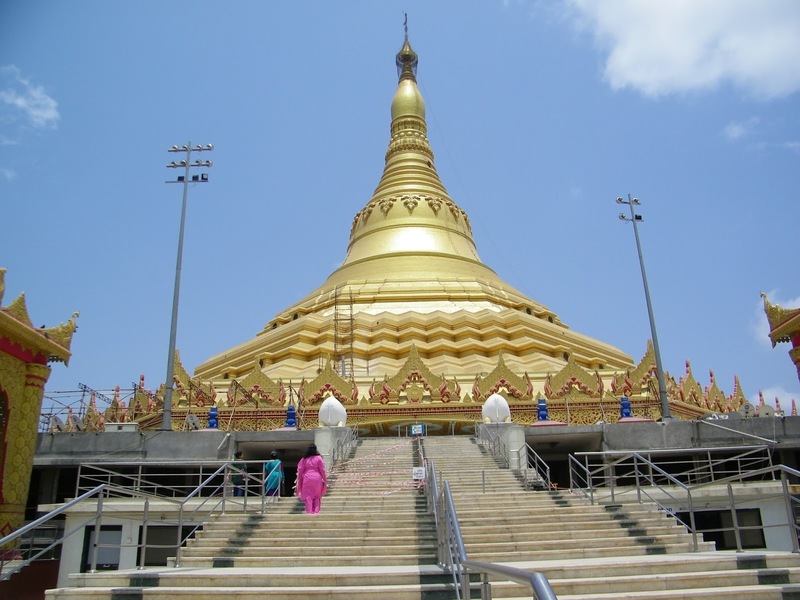 The Global Pagoda was built as a token of gratitude towards a Vipassana teacher and Accountant General of Independent Burma, Sayagyi U Ba Khin, who was instrumental in bringing Vipassana back to its country of origin after it ceased to exist in India. It is a meditation hall constructed in the traditional Buddhist architecture. The primary objective of the pagoda is to show gratitude towards Gautama Buddha for diffusing the universal teaching of eradicating misery caused mainly due to material attachment. It also plays an integral part in revealing the actual truth of Buddha's life and his non-sectarian lessons and provides a space to practice Vipassana Meditation. The Maharashtra Tourism Development Corporation (MTDC) teamed up with a Marathi News Channel, ABP Majha, and reviewed the Global Pagoda along with 350 other destinations and decided to title the Pagoda as the seventh wonder of the Indian state of Maharashtra. Many visitors frequent the Global Pagoda during the stressful and painful phases of their lives and manage to achieve total harmony in the chaotic times of today. The Global Pagoda's planning began in 1997, but the actual construction started only in 2000. The idea of constructing a Global Pagoda was proposed by Shree S.N.Goenka, to spread the true teachings of Lord Buddha. Over the years, religious dogmas prevailed, and the correct path of Dhamma was forgotten. These lessons had to be instilled again in the minds of people who were blinded by the religious dogmas and the introduction to an improved way of life was required to increase tolerance and maintain peace and harmony in the world. Acharya Goenkaji firmly believed that the Pagoda would serve as a helpful vehicle to spread the true meaning of Dhamma and inculcate the age-old technique of Vipassana that ceased to exist nearly two million years ago. For the exemplary work put in by Acharya Goenkaji, he was awarded the title of Padma Bhushan in the year 2012 on the occasion of Republic Day. A little over a year later, on 6th June 2013, the Global Pagoda was included in the list of the Seven Wonders of Maharashtra for its development, architecture and purpose. The Global Vipassana Pagoda has been constructed on 13 acres of land and is an illustration of the traditional Buddhist architecture with traditional Burmese designs. The Burmese designs have been included in the structure as a sign of respect and gratitude towards Myanmar for preserving the practice of Vipassana Meditation. The dome-shaped pagoda is a combination of ancient and modern Indian technology, and its shape is a replica of the Shwedagon Pagoda (Golden Pagoda), Myanmar, which makes the structure strong enough to stay put for at least a thousand years. The entire structure is covered in gold coloured paint, and the spire or the shikhara of the pagoda is covered in real gold that was donated by the Burmese. The spire is topped with a decorative piece that resembles an umbrella. The humongous inner dome enables 8000 people to practice Vipassana meditation together at one time. The entrance doors are made of wood that has been hand-carved intricately in Myanmar. The foundation of the structure is made of Basalt rocks, and the dome is made from sandstone that was brought from Rajasthan. Each sandstone block weighs around 600 to 700 kilograms and is secured in place with the help of bricks designed to interlock. These uniquely designed bricks and lime mortar hold the sandstone in place and help the structure stand for several years. The large pillar-less dome, in the centre, has a height of 29 meters. The entire structure of the pagoda is 96.12 meters tall. The interior of the pagoda is hollow and serves the purpose of a huge meditation hall; which covers an area of 6000 square metres. The top of the pagoda is completed with a large crystal. Vipassana is a form of meditation that helps achieve personal purification of the human mind. It is considered the highest form of awareness of the mind and matter in its true nature through unbiased and unattached observation. It is an efficient way of meditation to relieve one from the endless cycle of birth and death. It involves elimination of negative thoughts & habits of anger, greed, corruption, illusion, fantasy etc. and provides a perspective that helps humans achieve clear consciousness. The initial step of this technique requires the participant to quiet their mind through Aanapana which is done by focussing on their breathing. The essential practice of Vipassana needs participants to go deep inside themselves till they can penetrate beyond subatomic particles; which means penetrating into the absolute without external aid. This technique is thus considered scientific and doesn't involve religious beliefs. The basis of the meditation technique is Sila (moral conduct). Further on, it is strengthened through Samadhi (concentration of mind) and the purification is achieved through Panna (wisdom of insight). It mostly stimulates and builds the human qualities of Karuna (compassion), Mudita (sympathetic joy), Metta (pure love) and Upekkha (equanimity). It doesn't include any methods of hypnotism or mystical powers, however; these powers may be awakened with this active form of meditation as the human awareness and concentration increases. It also induces Peace of Nibbana, which means transforming the human mind and take them a step closer to achieving freedom from sufferings. Beginner Course: The beginner course is a 10-day course during which they have to follow the course rules and regulations that include adhering to the timetable, not harming any living being, no sexual misconduct, no lies and no consumption of intoxicants. The students practice ten hours of meditation every day (includes regular breaks). The first three days are to develop concentration through Aanapana and the next seven days are for complete Vipassana Practice. On the last day, the Metta Bhavana technique of meditation is taught and practised. These courses are bilingual and can be attended by participants who do not understand regional languages. Old Students Short-term Course: The participants who have completed at least one 10-day program are considered as old students. They can enrol for a 3-day short course each year to stay updated with the technique. Advanced Courses: This includes the same timetable as that for the beginner courses, however, the duration and the intensity of meditation is a little more advanced. Participants can choose between 20, 30, 45 and 60 days of course periods. Children's Course: These courses are designed to help children in the age group 8 to 12 years learn meditation. Places to visit in MUMBAI. Top visiting places in MUMBAI.